What I believe drives my actions. How I experience the world influences my behavior. Your inner world creates your outer world. Which is a whole other blog post in itself. Photo by katerha. I read through your latest ezine this morning end-to-end. Thank you–you’re Awesome, and I love that you’re sharing your gifts with the world. I’m in a reflective state today, as I just had Orthognathic jaw surgery yesterday, and i’m in recovery mode. All is going fabulous, and i’m enjoying my reading time. About 4 years ago, I had the opportunity to see Debbie Ford LIVE @ Principia, an annual Leadership conference I go to that we have discussed previously. Debbie used to work with Deepak Chopra, and then found her own calling. I found out just recently that she passed away earlier this year of Cancer. However, the legacy she has left behind is inspiring. She created a movie called “The Shadow Effect” that specifically addresses the light and dark in each of us. She made it her purpose to help people come to peace and embrace their shadow, and thus in the process, transforming thousands of lives for the better. Most of the items on your Belief list resonate with me and I believe many of them are based on universal truths. I imagine you may have read, and possibly talked about “The Four Agreements” by Don Miguel Ruiz. The simplicity of these 4 agreements are SO POWERFUL. I highly recommend this book to anyone who is on a journey of learning more about who they are. I am currently finishing up the sequel called “The Fifth Agreement: A Practical Guide to Self Mastery”. Ruiz revisits the Four Agreements from a new perspective that is magical before introducing the Fifth Agreement. So many of the items on your list are validated in this book. KB–Thanks for contributing your wisdom (pithy and concise) to this thread. Much appreciated! Dave–you and I have a shared love of learning and being givers. 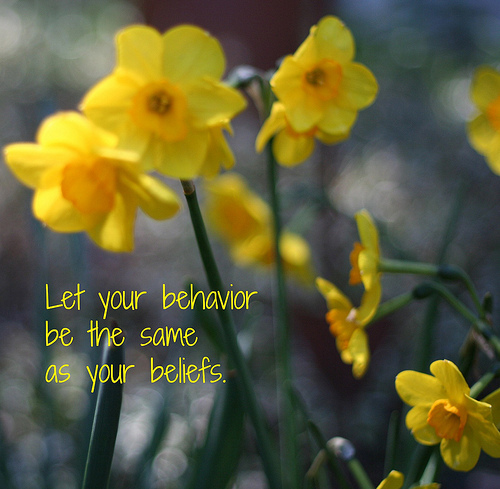 It shows up in both our beliefs and actions, doesn’t it? Shawn–I had that same surgery about 15 years ago, to correct TMJ, so I can sympathize! I’m guessing you are on a liquid diet for awhile–at least that was part of my recovery phase. I hope you continue to have a smooth recovery. I discovered Debbie Ford’s work this year, right after she died, and read her book, The Secret of the Shadow. Powerful stuff. I love the compassion and courage that comes with her approach to embracing both the light and dark. Her take on life is inspiring. It must have been quite an experience to see her speak. Thanks for the links to her work. I have read the Four Agreements and it’s been awhile. They deserve a re-reading, as I agree they are both simple and transformative. Had not heard that there is a sequel but it sounds like it’s worth checking out. So many books, and so little time! Thanks, Shawn, for your thoughtful comments and kind words.